Petite Crevette is why people ignore common sense (your studio with no dishwasher costs how much?) and refuse to live anywhere but New York. 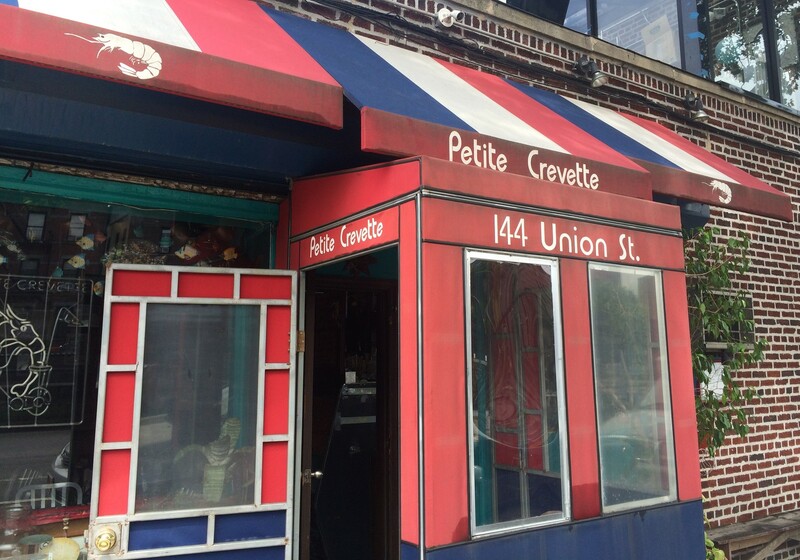 Petite Crevette is the type of place you could walk past a hundred times without noticing before finally popping in. Petite Crevette is one of those rare neighborhood spots that caters to area locals, without being pretentious or exclusive to outsiders. Petite Crevette is kind of just a fun name to say, and makes you appreciate what a gift Alex Trebek is to all of us. Sitting on a less-than-picturesque block on Union and Hicks (mmm ya smell that? It’s the BQE), this is a local seafood gem with a seriously dedicated following. The dining room is small - it squeezes in maybe 20 bodies at a time - and often crowded. But the two aren't necessarily related. There are plenty of cutesy, quaint places in this area, and few of them see the same kind of nightly turnover. The menu isn’t huge, but there are enough reliable fresh fish dishes that you can come back again and again without having to reorder the same thing. Yes, cash-only is annoying, but a BYOB policy with a very minimal corking fee ($5 last time we went in, and no charge the second time) makes up for it in a big way. Plus there's no need to schlep stuff in advance thanks to a bodega on the nearby corner for beer, and a wine shop around the way for a bottle. Like any good local spot, Petite Crevette is full of character. The dining room looks like the owner went to a yard sale and just bought the entire lot, with an assortment of knickknacks placed at random. You know, put the mannequin down here, hang the bird clock over there, and just chuck that hub cap wherever. Oh, and the chef has been known to throw lobster at fussy customers who question the freshness of his product. Like we said, a neighborhood place full of character(s). Solid veggie starter if you're in the mood. A mix of mushrooms sautéed up in a sherry vinaigrette sauce. A good share for the table. Oyster first, fried second, these are my new favorite fried oysters. Most fried oysters are heavy on the fry, light on the oyster, but not these. This plate of five-to-seven oysters are coated in a little bit of breadcrumbs and then seemingly flash instead of deep fried so they have a little crunch without being anywhere near greasy. The oyster still shines. And boy does it shine. A light, tomato-based fish stew. Chock full of seafood, with half a meaty lobster (don't sleep on the swimmies), two scallops, two shrimps, and a healthy dose of mussels. A very good sampler of the seafood, and something almost every table seems to order. A bit odd to see a Thai curry on the menu at this place, but it is a very good rendition. The reddish-yellow curry is a solid mix of sweet-and-heat, but as with everything else in this place, the fish does the heavy lifting. Instead of the thinly pounded chicken or beef you are used to in your curries, this dish comes with a healthy portion of perfectly cooked, flaky cod. The curry is excellent, but the cod is a solid meal on its own. Beef, salmon, and tuna varieties. If you are simply in the mood to eat with your hands, go for one of these. That said, if you want salmon or tuna, you might as well get the entree version instead of the burger as the portion is a bit smaller and the bun is pretty worthless. Side of fries were done up nicely though. They have a daily serving of Dorado, Branzino, and a wildcard (think Snapper, Porgy, Cod). Grilled up nice and barely filleted, you should plan on getting your hands dirty picking your way through this guy. It's tasty if you throw enough lemon on it, but not the best whole fish we've ever had. One too many dry bites to score an A.
Cooked well and full of flavor. If you really don't want to eat seafood (that's sad), this is a solid entree option. This Red Hook sandwich shop is one of the greats. The always interesting Tatiana Restaurant & Night Club on the Brighton Beach boardwalk - because sometimes dinner is about more than just the food. Sometimes, it's about fire gymnastics. Almost everything on Pearl Oyster Bar menu is fantastic, but what really keeps us coming back though is the fried oyster sandwich. Pier A Harbor House is one of the best dining al fresco restaurants in NYC, complete with a view of the Statue Of Liberty and a massive outdoor/patio situation. Flex is a restaurant import from Prince Edward Island, which immediately gives it some credibility - "P.E.I" as they call it, is the source of some of the best mussels the world has to offer. Abuqir is a small Egyptian restaurant in Astoria with incredible seafood. La Sirène has changed a bit over the last few years, but this French cult favorite in a strange part of SoHo is still pretty damn good and pretty damn authentic. A Carroll Gardens Mexican bar and restaurant, owned by Jim Cramer from CNBC. Surprisingly, it is entirely devoid of yelling. It’s pretty damn good, too. The boil is fine if you're looking for a night of eating seafood with your hands, but don't expect a real New Orleans experience. Expect butter and Old Bay and that's about it. Some of the best sandwiches in Brooklyn. Court Street Grocers is a Carroll Gardens favorite, but it's good enough to travel for, too.